Early Maincrop - homebred Skea Organics Ltd variety..
Maincrop currently in 2nd year NL trials. A new homebred Skea Organics Ltd variety. Pink skin and white flesh, high yielding with good taste, it holds its shape very well, great for boiling, mashing and wedges. 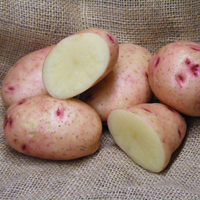 2nd early general purpose variety; high yields of oval, cream tubers with cream flesh; good resistance to foliage blight, tuber blight and potato virus Y; very popular with commercial organic growers. 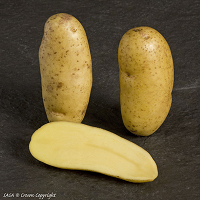 Early Maincrop - A creamy-fleshed and waxy potato suitable for salads and boiling. Unfortunately we can't supply Shona this year due to quality problems. Early Maincrop - White skin and cream flesh. Potatoes delivery is based on weight, and it is calculated automatically as you add the nets to your basket. The banding is as follows:: 1.0kg ~ £4.95; 2 - 3kg ~ £7.00; 3.5 - 18kg ~ £8.00. If you require more than 18kg or delivery to Isle of Wight, Northern Ireland and Scottish Highlands (AB37-56, FK19-21, IV1-63, KW1-14, PA21-40, and Scottish Offshore, please call for price (01354 740553). To share the cost of postage please order with a friend.